If dance music was overhauled in Chicago and politicized in San Francisco, it's being kept alive and thriving in Manchester, England. An ancient industrial town to the north of London, Manchester has a rich pop history stretching as far back as the 1960s and the Hollies. Joy Division came from Manchester; so did the Fall and the Smiths. The modern Manchester sound was incubated in nightclubs such as the Hacienda, recently re-opened after a 16-year old girl died on the dancefloor there a few years ago of an overdose of ecstasy. The Hacienda was started by members of Joy Division, and most recently has spawned a host of big-beat dance groups, from the Stone Roses and Inspiral Carpets to the Happy Mondays and 808 State. What separates 808 State from the rest of the Manchester lot is the group's commitment to dance. The others have set up camp on the border of dance and indie rock, incorporating hard guitar alongside the big beat of dance music. 808 State, on the other hand, has concocted a raw and dense, predominantly instrumental-based dance deviation. The group has no intentions of sitting on any proverbial fences, and that's what makes them Manchester's most important new pop group. "I don't know what people want from a group," says 808 State bigmouth Graham Massey. "The Happy Mondays have a controversial frontman and focal point for marketing and things - that's cool." Massey, speaking from his home in Manchester, is sizing up the latest British hype machine. 808 State, unlike most current British groups, has sort of a non-image. "In a club situation, our music is very anonymous," he continues, "and a large portion of it is instrumental. A lot of people who come to hear dance music don't care who's making the music, as long as the immediacy is there and it's alive." 808 State got together to make records, not to form a band. The distinction is important. In England in 1988, the climate had shifted away from rock, and club music became dominant. This explosion was by no means accidental; after all, American house records had started flooding the U.K. and the sound had been embraced, particularly in Manchester, where the ecstasy drug culture had also begun to take shape. "An atmosphere was created in these clubs that was particularly special and we formed to make more of that kind of music," says Massey. "We could only get that music on import from America and you could only afford, like, two or three records a week. That wasn't enough to fill a whole night's worth of music." The group took its name from the Roland 808 drum machine, the rhythm device of choice among house music pioneers in the U.S. The group originally teamed up with an-other Manchester dance purist, Gerald Simpson, but after a falling out, Simpson left to be-come A Guy Called Gerald. 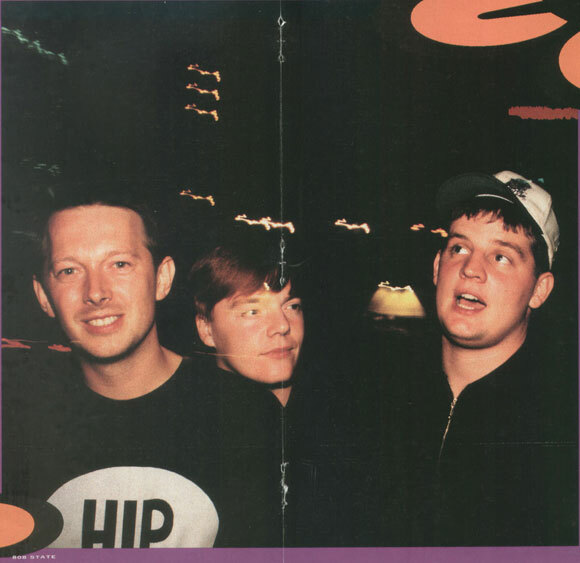 Massey says the members of 808 State had become disenchanted with rock's limitations and pursued dance music as a fresher avenue to explore. At first, he says, "We started making our own imitations of American dance records, but we quickly realized that it was a lot harder to do. I had been in an experimental funk outfit for about six years and was going nowhere. All of a sudden, dance music seemed exciting at the time, and was like a rejection of all of the old ideas." A year before 808 State was formed, Massey took an engineer's course to learn more about computer technology. That was in 1988, when a big explosion in music technology had made samplers and sequencers much more affordable and flexible. "We had al-ready been toying around with technology for about two years prior to learning how to use the equipment," he says. At the time, Massey had been working with Martin Price on creating texturally dreamy soundscapes. Those two paired up with Darren Partington and Andrew Barker, known about Manchester as the Spin-masters, the most talented hip-hop crew in the local clubs, and 808 State was born. Price had a record shop called Eastern Bloc, built in a gutted department store in 1988. Eastern Bloc not only financed the group, but its white label also pressed 808 State's first singles and first two albums, New-build and Quadrastate. Eastern Bloc was also a social club of sorts, where club DJs would hang out and congregate and bring in demo tapes. Around the block from the Bloc was a cheap recording studio, where Massey would take people to record their music. He also helped land people gigs at the Hacienda. "The accessibility to everything was just right," Massey says. "It felt alive and exactly how pop music should be. But I think that if anyone now would hear our first album, they would realize that our sound has progressed by leaps and bounds. We've now accepted the fact that we are from England; we are what we are and have adapted the music into our own style and mutated it." On 808 State's latest album, ex:el (Tommy Boy), Massey and company finally succumbed to using vocalists over the top of their alien soundscape. New Order's Bernard Sumner sings on "Spanish Heart," and the Sugar-cubes' Bjork Gudmundsdottir sings on "Qmart" and "Ooops." Sumner's contribution is fairly straightforward, but Bjork's yelps and stutters are as alien-sounding as 808 State's music. "There are so many bands in England now working in the same area," says Massey. "The first thing they do is stick a gospely soul singer out in front, which is an obvious choice. Some of that music is great, but we're never about an obvious choice, because we want to keep an edge to what we do. We're very shy about working with vocalists and it's not some-thing that we're best at. If it wasn't for the fact that Bernard and Bjork approached us, we probably would never have gotten around to approaching them." Still, Massey realizes that the group has to grab attention on albums in different ways than it does in the clubs or on singles. "In order for our albums to work, we have to have a mood build throughout," he says. "We have to hold the listener's interest over an hour and I don't think you can do that with just straight dance music. You have to widen the boundaries. I think that one of our problems is that our music is sometimes too complicated for club music. We always set out to make a club record, but we inevitably begin to add layers. We're learning to strip it down a bit." Massey sees dance music as a fertile and limitless field. "One of the things that appeals to us about working in the dance area is that you can do almost any kind of music within it, whether it be a rock record with a dance discipline or something very orchestral with a dance beat." In fact, 808 State recently scored the theme of the BBC television show, The Word. Massey says they'd like to continue doing soundtracks. "If we were a rock band, we'd have to work with certain inherent limitations. The drummer can only play a certain way, and the guitarist may only know certain licks. With technology, you can actually push the boundaries all the time." Though 808 State still plays club gigs, the group has come a long way since their early performances doing hip-hop nights they promoted themselves. Back then, MC Tunes would play with A Guy Called Gerald as the DJ, and 808 State would close the evenings with their early house sound. "We used to empty the clubs at the end of the night by playing house music," Massey recalls. "The crowds were appalled by it and said that it was a fad which would die out in a couple of months. We much prefer studio work, but if you do a big show - like 12,000 at the G-Mex in Manchester - the atmosphere is ready for a rave. It really works well when we bring a laser light system and involve DJs and rappers. "Our music is looking forward rather than looking at the past," Massey concludes. "The reason why we're interested in dance music is that it's got an edge, and that it's always sort of unknown what we'll come up with."